As the next ECB meeting approaches on 6 September, the debate about potential ECB intervention is heating up. This past weekend was particularly interesting with two key German players weighing in with their views – even more importantly these views turned out to be increasingly divergent. German ECB Executive board member Jörg Asmussen (on the right of the picture) revealed more details on potential ECB intervention yesterday, saying, “Under the framework of the new programme, the ECB will only buy bonds with short maturities,” adding the caveat that, “The whole discussion will be led by the requirement that any concerns about treaty-violating state financing are dispelled. We will only act within our mandate.” Asmussen also stressed that he would like to see any ECB intervention initiated in tandem with use of the eurozone bailout funds, saying, “The error with Italy…must not be repeated,” seemingly referring to the Italian government's failure to take full advantage of the time bought by the ECB over the past year. Meanwhile, Der Spiegel has a lengthy and interesting interview with Bundesbank President Jens Weidmann, the other German on the ECB’s Governing Council, in which he renews his opposition to any greater intervention by the ECB, warning, “We shouldn't underestimate the danger that central bank financing can become addictive like a drug,” adding that proposals for ECB bond purchases were "too close to state financing via the money press”. Together, these two men represent Germany at the ECB, so for them to strike such different tones is rather surprising (although it has been hinted at previously). Asmussen remains much more positive and supportive of Draghi’s position, while Weidmann takes a more traditional German stance against any prospect of monetary financing of government debt (a position which has garnered significant support with the German public). The real question though, is who has the support of German Chancellor Angela Merkel? That remains unclear, particularly with both having previously been close advisors to Merkel. The Spiegel article suggests that Merkel has become somewhat impatient with Weidmann's strict ideological stance, especially as it begins to hamper a potential path to crisis resolution (at least in her eyes). However, last week Handelsblatt suggested Merkel had in fact decided to side with Weidmann over Asmussen. If this divide continues, the issue will likely come to a head leading to some tough decisions for all involved – in fact any decision to sanction greater intervention would make Weidmann’s position in particular quite difficult. Choosing who to support will be a difficult political decision for Merkel which goes beyond just figuring out how best to solve the crisis – she must weigh the public response at home and abroad, the market impact, her relationship with ECB President Mario Draghi and her support within her own party and the broader German coalition. Asmussen also has to tread a careful line as, despite being independent, he risks seeing his influence and support within Germany decline rapidly. Weidmann, whom many have suggested has already become isolated, risks a similar erosion of support, although abroad and within the ECB rather than Germany. If greater intervention comes to pass, as seems increasingly likely, the spectre of his predecessors Weber and Stark, both of whom resigned from the ECB Council in protest, will undoubtedly loom large. As we have noted countless times before the role of the ECB cuts right to the heart of the German approach to the eurozone. Expect plenty more developments on this front in the near future. Jörg Asmussen is a lobbyist of the finance sector. Period. 1. Both are independent. At least officially. 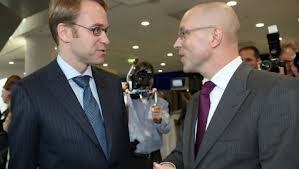 Weidmann is very popular in Germany. Anyway it will be very hard for Merkel to get rid of him (even if she wants that) as he simply looks to have made the decision to go to battle (unlike the 2 before him) and trying to fire (not officially) him will make her very unpopular. 2. Merkel probably doesnot see a real solution happen politically and has been testing the water on more ECB interference. To keep it realistic. Everything she has said however could at the end been interpreted in several ways. Seen now that this is clearly a bridge too far she is stepping somewhat back. 3. Draghi has made the mistake imho to take Merkel's words a month ago or so in the same way as if they were said by a CBer. He missed completely that she is a politician who often in difficult issues simply tests the water and changes her ideas. Furthermore Draghi has clearly made a mess out of the relation with the ECb's (by far) main backer the Buba (by bringing Weidman as the only one against in the open). Furthermore that weidmann looks to go for a fight. Imho it is verystrange that markets are so positive as a messed up relation with the Buba makes a structural long term solution nearly impossible. So although media are not talking about this Draghi has lost a lot of credibility in this. If he cannot deliver he and the ECB will most likely be punished. 4. CSU are digging themselves in. My idea that they will get something (say a Greek head). FDP is making their standard u-turn. Completely uncredible party. Dutch might vote against Greece 3.0 everybody is forgetting. 5. Greece looks to be a major problem. Effectively the troika is making the wrong report per a later date. Most likely explanation either a defer strategy or trying to keep them aboard whatever happens. Also not unlikley like the ECB with the ELA simply putting the problem where it belongs with the politicians that keep passing the hot patato to somebody else.